Red is the shade of adoration and what can be superior to a bunch of 12 Red Roses in a Glass Vase to express your sentiments. Blessing these to your friends and family and construct recollections to value all long. This gift item is best for valentine’s gifting. It’s a bunch of 12 red roses kept on a glass vase with some fillers. Roses have different meanings as per their color and number. Some filler also comes together with the roses and glass vase. This gift item is best for interior decoration. Red roses with fillers kept on glass vase are a nice showpiece for your living room. Elate your special someone with this fabulous gift item. 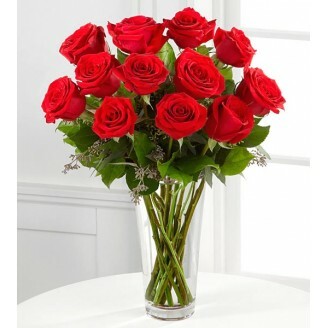 12 beautiful red roses in a glass vase. You can gift this beautiful item to your wife or girlfriend as they will be flattered by your gift selection. Surprise your family members with these beautiful roses and let your relationship blossom with more love and care. Keep the flowers-the stems immersed in water to keep them fresh for a long time. Handle with care to maintain its beautiful looks for a reasonable amount of time.